In Volume 1 of our coverage of the Dakota, Minnesota & Eastern, videographer Mike Savona follows the railroad's mainline from Winona, Minnesota to Waseca,Minnesota, with the DM&E's operations from Owatonna, Minnesota to Mason City, Iowa, over IC&E rails, also included. We follow the tracks as they climb out of the scenic Mississippi River Valley, across the beautiful rolling hills of southeastern Minnesota, through the Zumbro River Valley around Rochester, and finally, we view trains as they traverse the open countryside of southern Minnesota and northern Iowa. Locomotives from DM&E, IC&E, CP, and even a St. Lawrence & Hudson outcast, are all seen in operation. Sit back and enjoy the sights and sounds of DM&E trains pounding along classic jointed rail, with the railroad's EMD workhorses doing what they do best. Today's DM&E is a far cry from the railroad that existed just ten years ago, as many extensive track rehabilitation projects, the purchase of the I&M Rail Link, and the takeover by Canadian Pacific, have all played a part in the transformation of this railroad from a scrappy underdog, to a viable competitor in the Midwest rail-scene. With coverage from 1996 to 2011, you'll see the transformation firsthand, along with a great variety in operations and motive-power that you are sure to enjoy. Come along with C. Vision Productions, as we bid farewell to the Dakota, Minnesota & Eastern and welcome the arrival of a new era under Canadian Pacific ownership. Richard Nelson (northern Illinois) on 2012-06-25 19:37:18. I thought that this was a very good DVD program covering the DM&E east end. The camera work was pretty good, with some interesting photo angles employed. 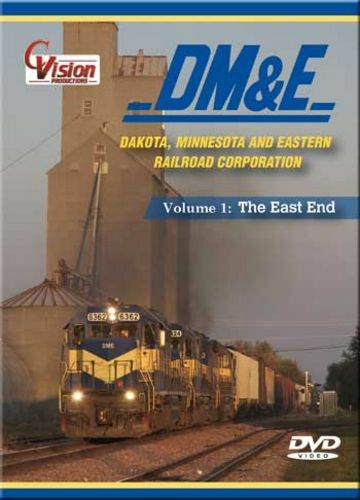 I look forward to the next DVD in this series, Volume 2 to cover the west end of the DM&E Railroad. Nathan (Lincoln, NE) on 2012-06-19 13:02:27. Overall I thought this was a well put together video. Ive always thought that C Vision could do a better job narrating its video's in regards to how much detail they give on certain things such as track rehabilitation, re-routes, etc. Im not sure of the exact dates when this was filmed but I do know that some of the areas featured now have welded ribbon rail which makes for better rail-fanning but that's just me. Overall it was worth the money to see the DM&E in action.